Focused and Fearless speaks to ordinary meditators who wish to attain non-ordinary states with ease. It offers a creative and contemporary slant to this ancient path of happiness and wisdom. Blended with contemporary examples, pragmatic exercises, and “how to” instructions that anyone can try, this book provides a wealth of tools to cultivate non-distracted attention in daily life and retreat. 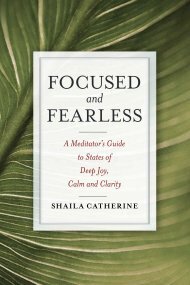 “Focused and Fearless is a beautifully written introduction to jhana meditation that demonstrates the importance and necessity of deep concentration. Without a concentrated mind one can not understand, by direct knowledge, the four noble truths. Click Here to buy both of Shaila Catherine’s books at a discount. For inquiries or to submit reader’s reviews contact books .